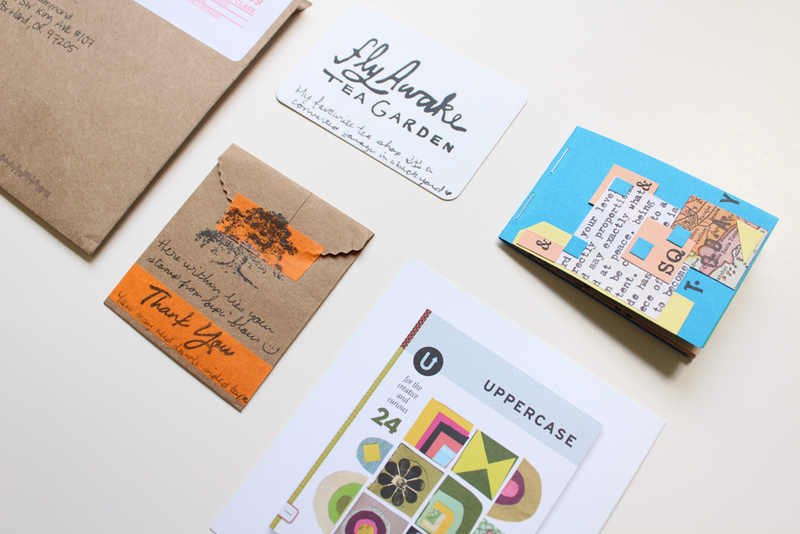 Ever since I made the little booklet for my missive mission mail, I’ve been into making little mail booklets for everyone. It’s so much fun! 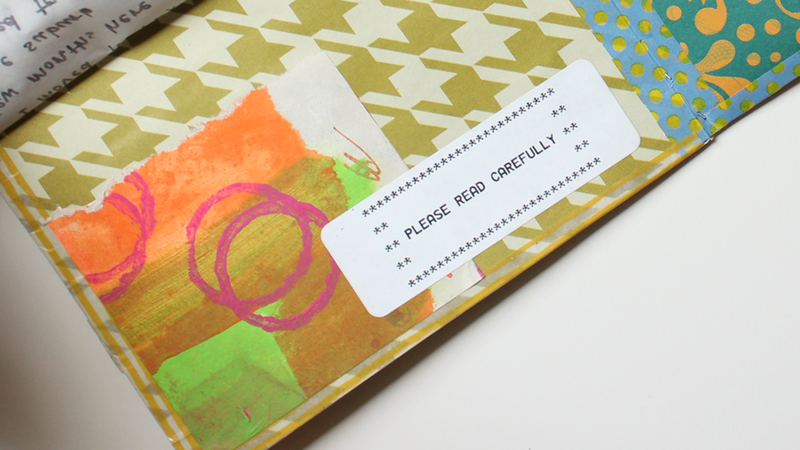 I like that it’s kind of like mail art within mail art. I do like to include bits and things in the stuff that I do send out, although not all the time, but the booklet is kind of it’s own thing. They are a little more time consuming though. I put this together for Supa’flous, or Sam. She sends me really unique mail so I thought I should return the favor. After she received it, she praised it on her instagram, which made me feel nice! I’m happy that it was well received. She deserves the best mail! Currently, however, I’m sitting on 7+ letters. I can never seem to keep up! I had a nice momentum going at the beginning of the year but I quickly crashed and burned due to other life happenings and laziness. I think I really need to start making to-do lists! I can never remember all the things I’m trying to accomplish or complete when I don’t write them down. 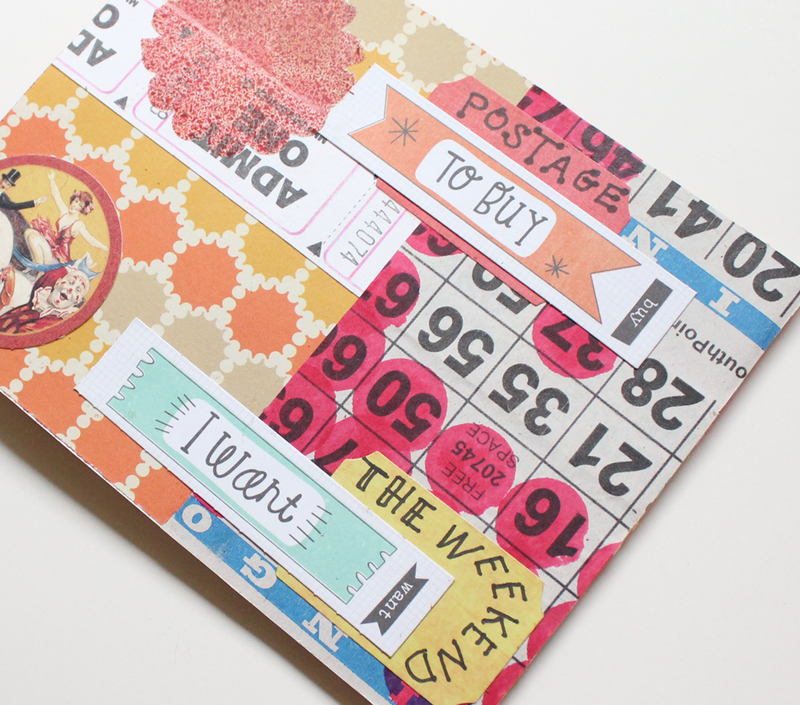 I’ve been a busy bee adding some new stationery sets to the shop! These sets were all made from some mixed media pieces I did. 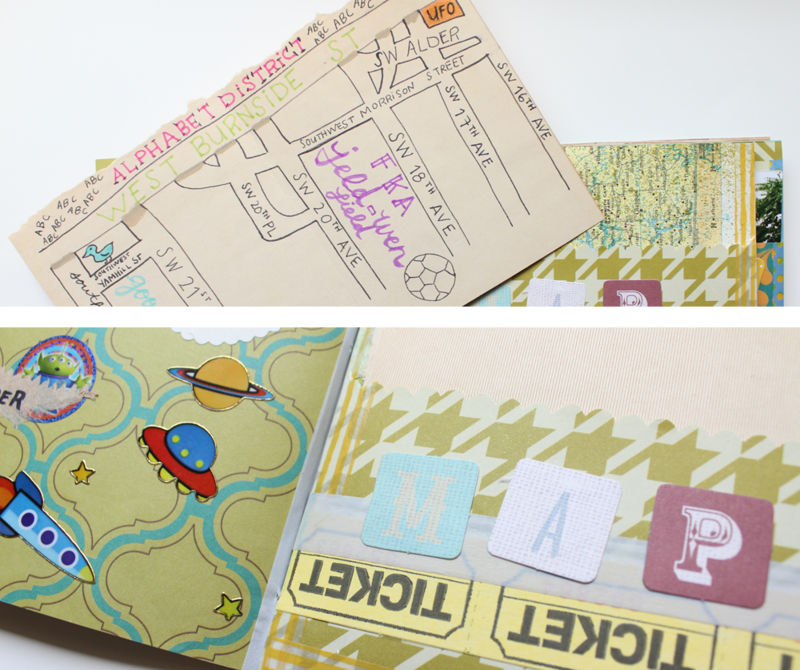 This is probably one of my favorite ways to make new stationery sets! I’ve been having a hard time collaging since getting more into paints and stuff. With these pieces, I do a little something-something on a 4×6 blank cardstock. I actually buy those blank watercolor postcard packs and they work so well. From there, I use paints, stencils, alcohol inks, stamps, and basically anything I can find. Sometimes I add scraps of paper but most of the time I don’t. After I finish with the postcard, I scan them into my computer and manipulate them in Photoshop to fit my stationery templates. 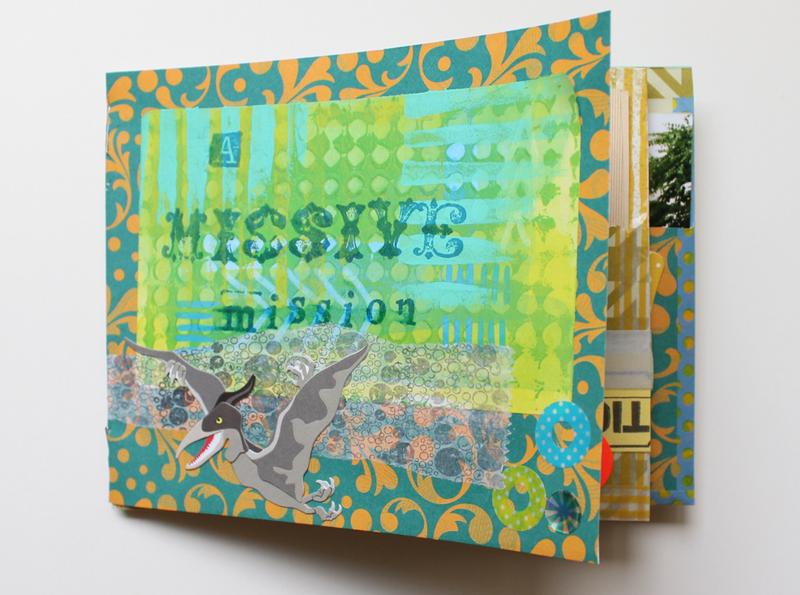 Another thing I have been doing with mail art pieces is the same process but using that as more of a background for a collage. I finish the mixed media pieces in record time. Collage seems to take me 30 minutes to an hour, depending on inspiration and motivation. I love just throwing paints everywhere and not really caring how it turns out. Sometimes it’s terrible but most of the time it’s pretty cool! Sometimes I am just completely in awe of the natural creativity of folks. For instance, this pen pal I met at the first Portland Correspondence Co-op, Supa’Flous. She wasn’t familiar with the world of mail art until that day, although she was familiar with sending and receiving mail. 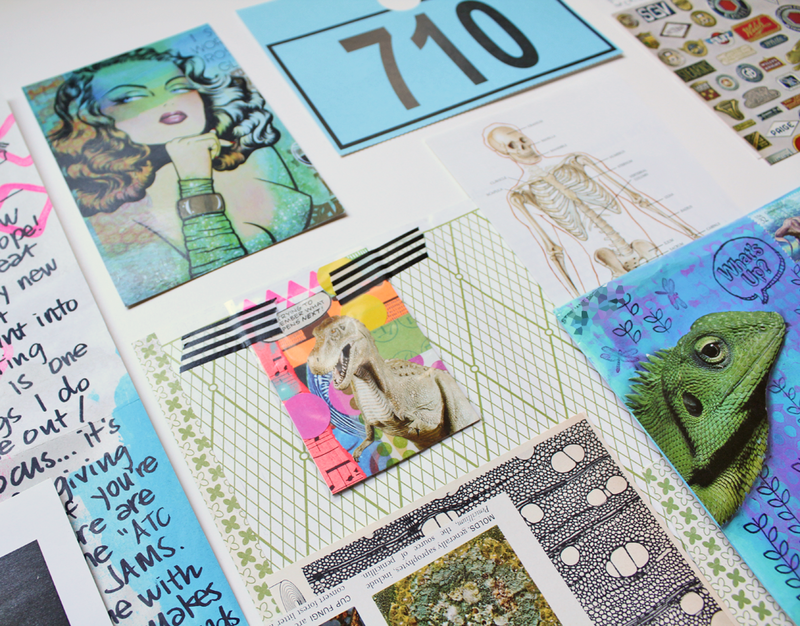 I chatted with her about the community that I have basically grown up with, the mail art community. 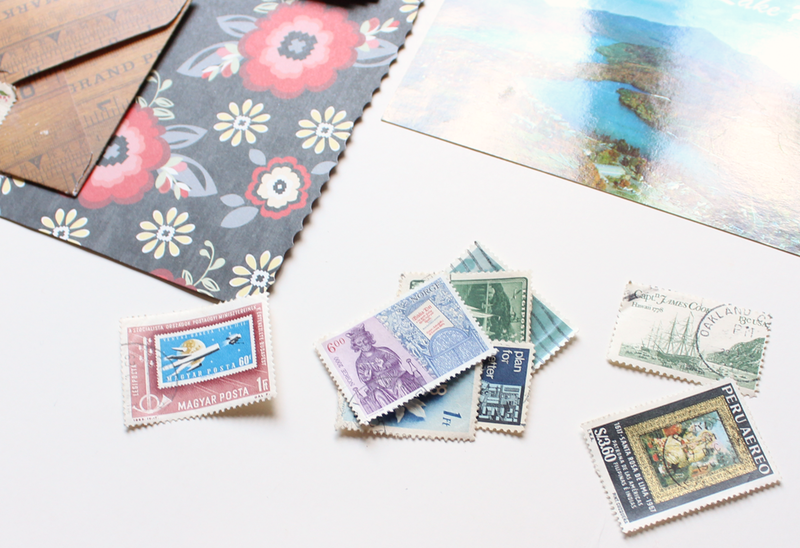 I showed her some examples of mail art, letters that I had brought with me, and she seemed instantly hooked! We exchanged addresses and that was that. The first thing I received from her, all I could think was that she was a natural! 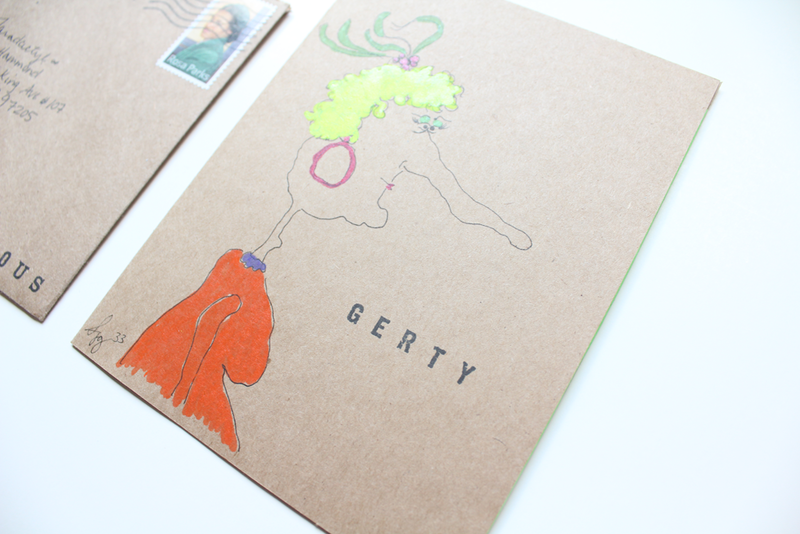 Her drawings are unique and she has some really awesome ideas of non-traditional mail. Here are some examples of the awesome mail she sends my way! 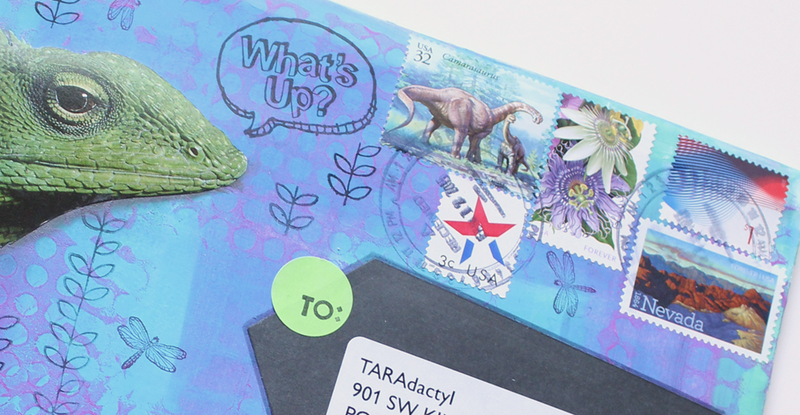 The majority of my pen pals are letter writing pals but Steph fits in a different category: mail art pal. I think she’s the only one (hmph! I need more). I received this amazing package awhile ago but it’s too good not to share. Steph has serious style. Like I-wish-I-could-be-her-style. Ok, maybe not that creepy. Specifically, her use of neon paints and bright colors is fantastic! She pulls everything together flawlessly. I don’t know how she does it! If you’re looking for eye-candy or inspiration, I definitely suggest giving her instagram a peek. 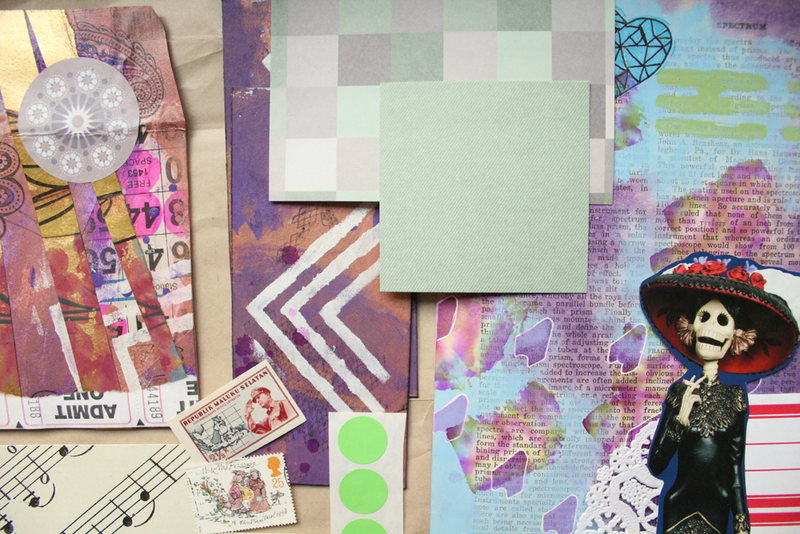 I can only imagine what her collection of images, ephemera, bits and bobs, scraps, and art supplies looks like. The various peeks she shares on instagram look overwhelming in the best way possible. Steph always sends a really great selection of papers and images. It’s always a treat getting mail from her! Yesterday I posted a little bit about the missive mission I went on last month. As I mentioned, I was sent on a top secret mission through the post. I thought this was such a cool idea and I was so excited to see what was in store for me. The only thing I found out ahead of time was that the lady, Marissa, who sent me on the mission was going to send me a postcard with the briefing. The postcard itself was a blurry picture of some buildings. It could’ve been any city, but it was probably Portland since it was from the UFO museum after all. The building’s name and address was listed on the back of the postcard. Marissa wrote that she was more interested in the surrounding neighborhood than she was of the museum itself. That worked out well since the museum is no longer operating! I was kind of stoked to go visit a UFO museum but, you know, you can’t always get what you want. I completely lucked out on the location — I was instructed to explore my neighborhood! The museum was in an area that is just a few blocks from my apartment, an area I know very well and used to walk by every day on my way to work. It was exciting to think about my neighborhood in a different way, see it in a different light. I was anxious to get working on my reply to Marissa. I decided to send my reply in some sort of zine-y format. My first order of business was drawing a map of the neighborhood. I love maps! You should know that I drew the goose and soccer ball all by myself. I wrote a little description of the neighborhood, what the area was like, how it’s like living there, and my thoughts about my home. I also included prints of the photos I took while exploring. I stole some soil from a near by tree as well as some leaves and flowers to share with Marissa. I felt like the dude from Everything Is Illuminated when I was carrying around the little baggie of soil! As I’m not one to check in to see if people receive my mail, I have no idea if Marissa received my report; I haven’t heard anything from her since the original postcard she sent. I sure hope she received it! I’m also considering sending out these little missions to anyone who might be interested. I have tons of postcards of places I’ll never visit and need to do something with them. What am I working on? Stationery, of course! 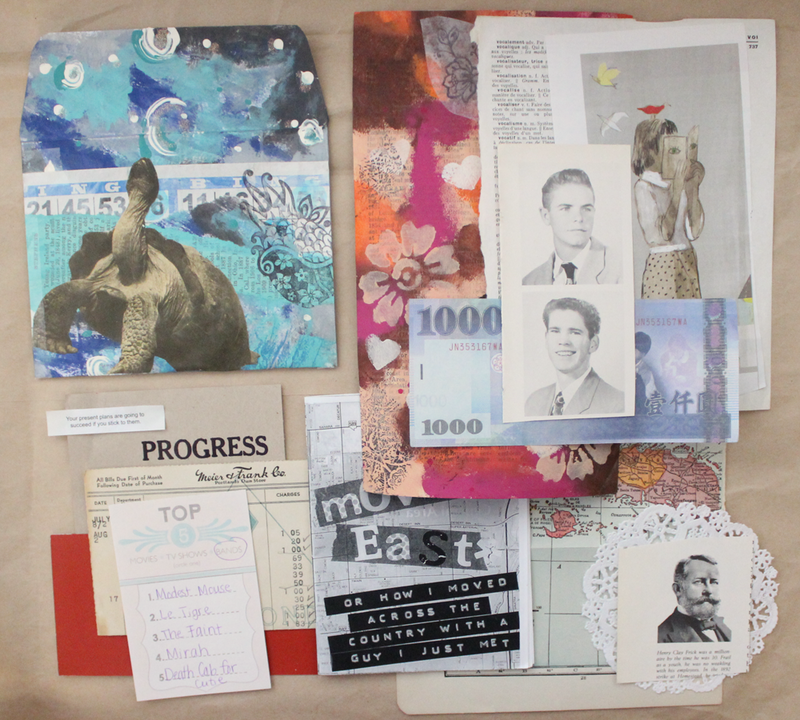 I’ve been straying a bit away from digital collage these days in favor of physical mixed media pieces. 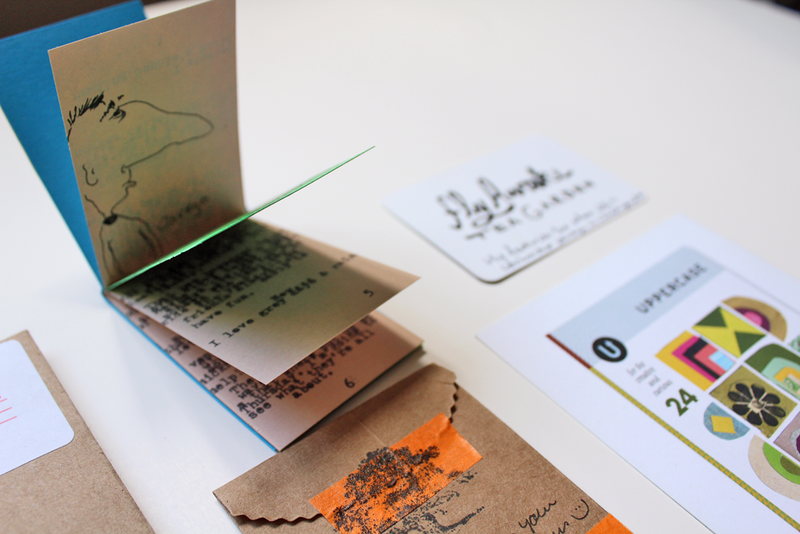 I’ve been buying little blank packs of postcards to make my creations. After I finish the piece, I scan it in and turn it into envelopes and stationery. 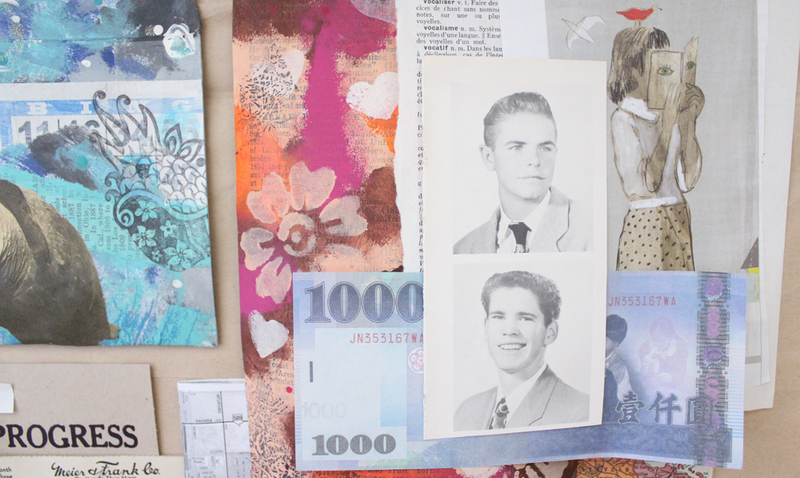 As much as I love the convenience of digital collage, there is nothing quite like getting your hands dirty! One thing I’m super into lately is patterns. I dunno what it is but I can’t stop stamping patterns on everything. 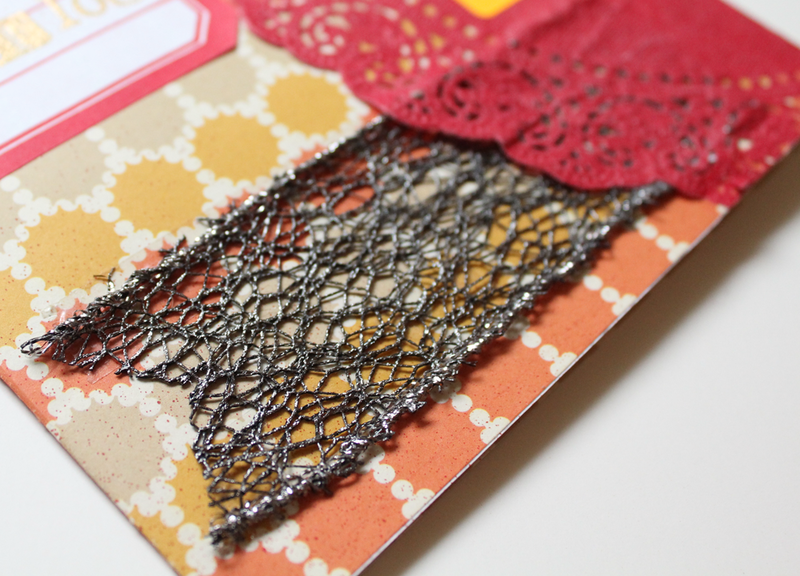 I think it might be because of the ink pads I recently purchased through Stampin’ Up. Thank goodness for birthday money! I can’t get over the quality of those ink pads though. They are amazing. Here is a really great incoming missive from one of my best pals, Mermeg. 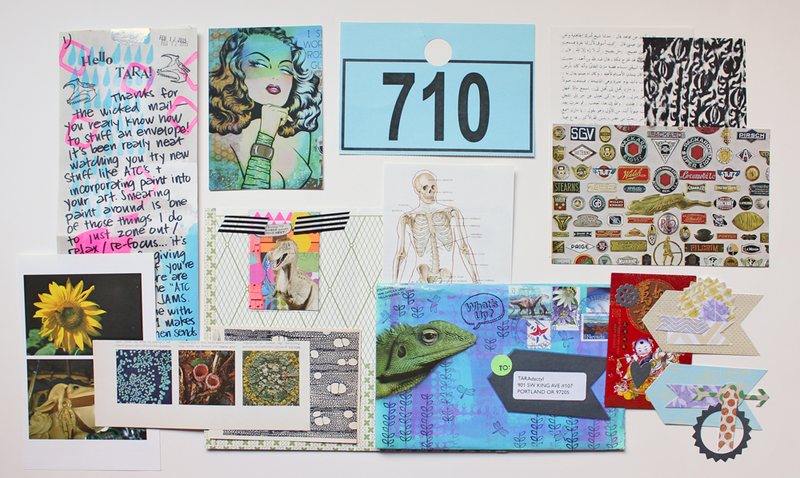 She really knows how to pack an envelope and collage one! 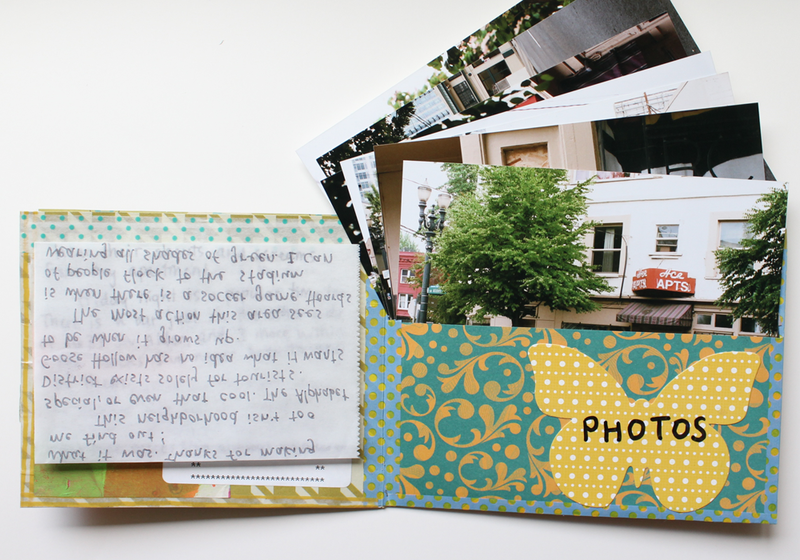 I think Megan is my longest-running pal at the moment; we’ve been exchanging mail since 2008. We have kept in touch over several moves (for both of us), different relationships, and other life happenings. It’s really amazing to think about. We’ve also had the pleasure of hanging out at least three times. It could be four but my memory is hazy. 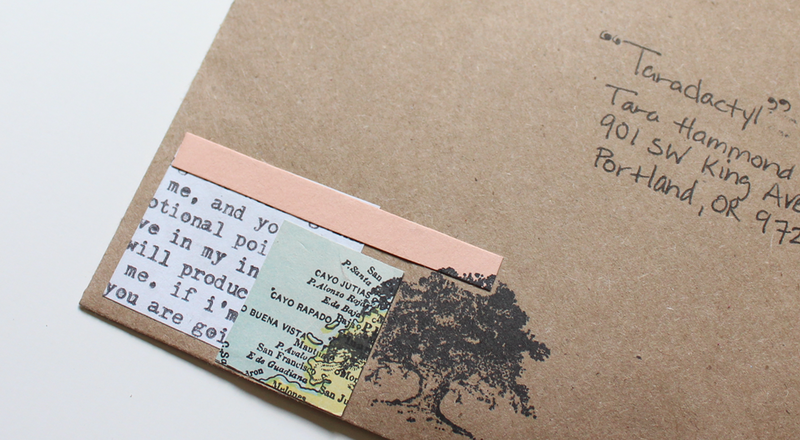 Most recently she came to Portland at the beginning of this year and we watched mail art videos on youtube. I’ll make it out to Wisconsin one day to hang out on her turf! Megan always seems to pick the most perfect items to send my way. I’m not sure if she just knows me really well or that we just have the same style. I don’t care either way because it just means I end up with loads of ephemera. Yes! Also, recognize some of those stamps? They were featured in Monday’s post! 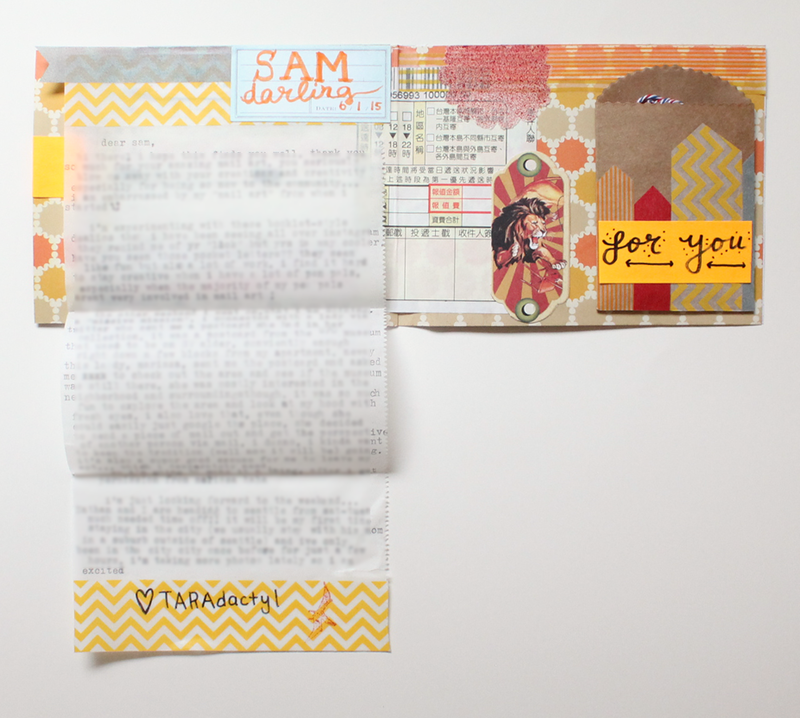 Here is a little something I put together for a new mail friend, Samantha. This seems to be the year of me sending out mail to new folks. I’m diggin’ it! I haven’t had much of a chance to look for any new pen pals for awhile. Mostly due to my own lack of motivation, but I also thought I’d hit my max pen pal limit. 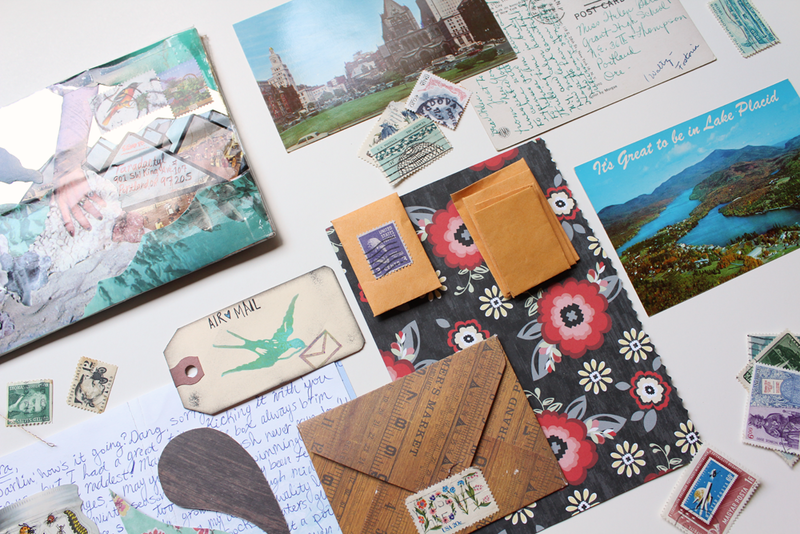 Turns out, if you respond to all of your letters in a fairly timely matter, you are able to write to more people! I’m sure I’ll be singing a different tune once I get bogged down by replies. I met Samantha at the PDXCC. 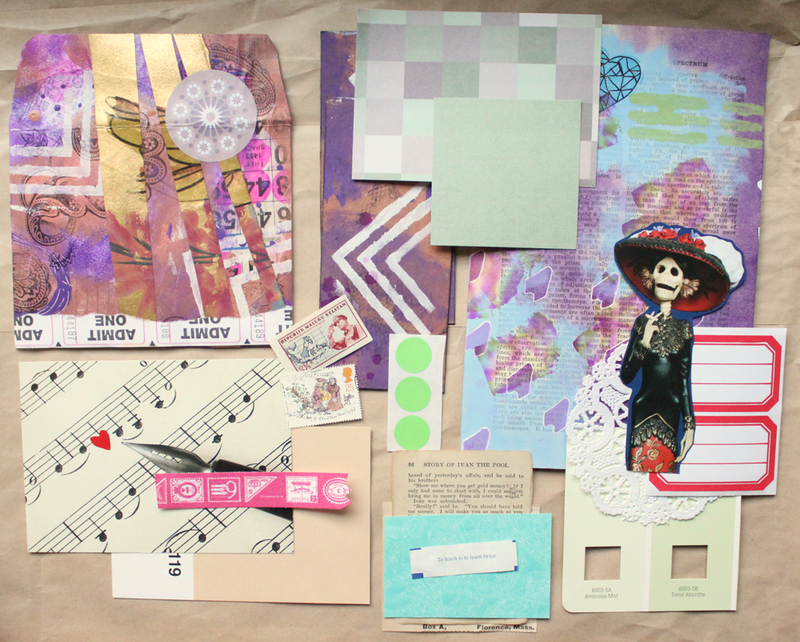 Although she regularly sent letters to her friends and family, she was new to the mail art world. We talked for most of the meeting, and I shared my experience in the snail mail community with her. 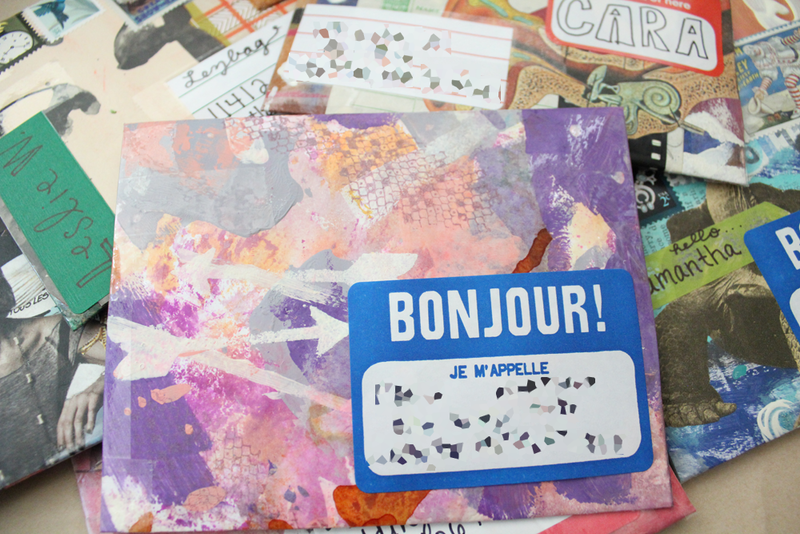 She seemed super intrigued by receiving mail that was more than just a letter so I wanted to send her something special; a nice introduction to the world of mail art. I hope she enjoyed receiving this! 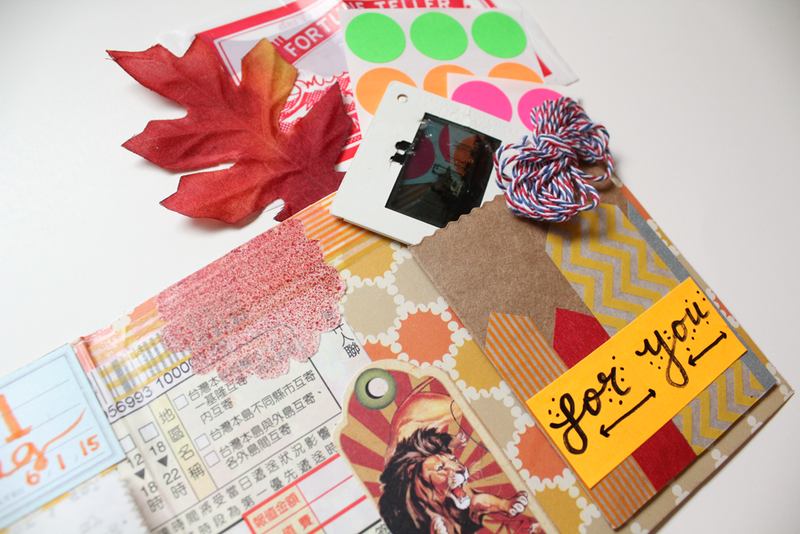 I have been having so much fun putting together mail lately. I’ve made a point to take more time to dedicate to the whole process, and not just taking the time to write a letter or make a collage. I think it’s been super helpful using paints to create my envelopes and stationery because I can get a lot done at once and it leaves me more time to find bits and pieces I think the recipient might enjoy! 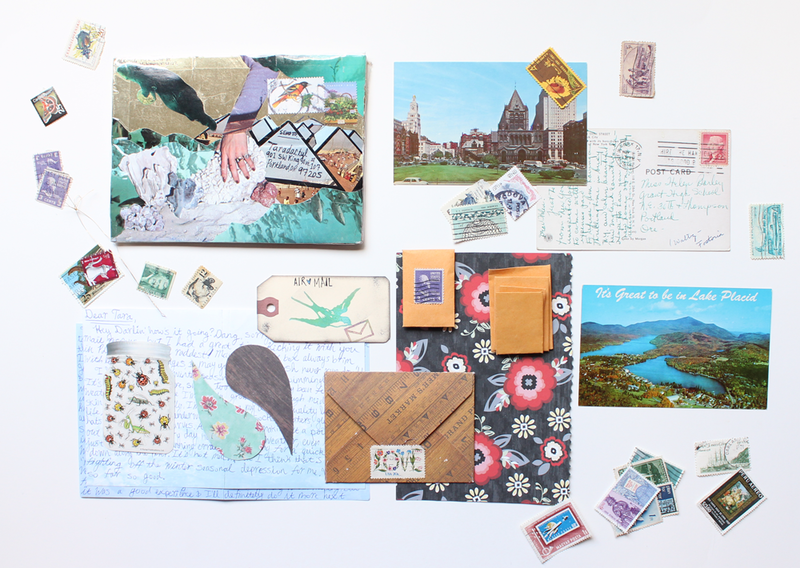 Another really lovely thing about including all sorts of ephemera in the envelope is getting rid of my stash. I tried organizing my paper bits last weekend and it was such a disaster. I just have too much stuff and most of it has been in my stash for over 3 years. It’s absurd! How long can you hold on to something until you realize you need to give it away? I’ve always wanted to do a video like this! Watching people create is one of my favorite things. I finally busted out my tripod and set my camera to record. As usual, I was watching something on Netflix while doing this, which is why I keep looking to the right. Haha. 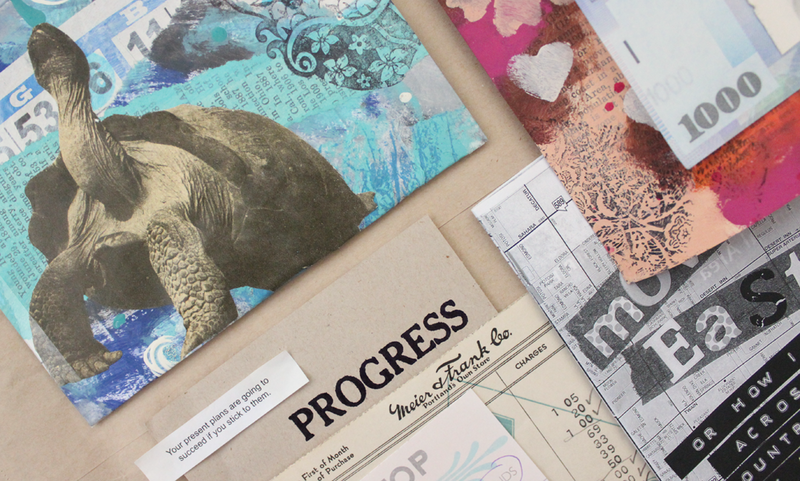 This shows a typical process for me when I am creating mail art. I don’t often (ever) set out to make anything in particular. I pick a paper that appeals to me and then set out on finding other things to paste on top of it. 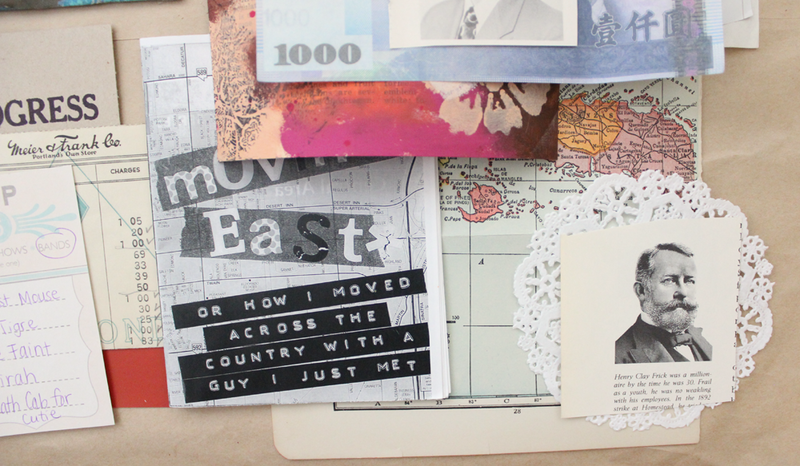 I like making one thing be the focal point of the collage, and I love layering papers. I’m often not satisfied with straight edges, which is why I rip a paper’s edge or use those scrapbooking scissors before pasting a paper down. This is actually really fun for me to watch, too. I do things without even thinking about them, and I fidget a lot more than I thought! Surprisingly, this collage took me about 50 minutes to complete! Thank god for time-lapse to condense it down to 8 minutes. I really want to do more of these! Maybe of something other than collage; carving rubber stamps?? Do you have any suggestions? Anything in particular you would want to see? Here is the finished envelope, all ready to be sent out!